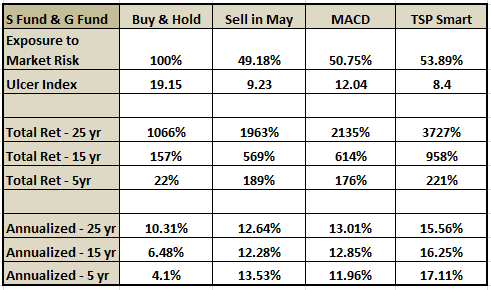 What is Sell in May? “Sell in May” is a generic name for a stock market seasonal timing strategy that has investors sit out of equities for approximately half the year in the safety of a low-risk investment such as T-bills, money-market accounts, or the TSP G fund, etc. The basic strategy and variations of it have academic support based in historical data and more importantly has been successfully employed as a long term low-risk timing strategy. The saying “Sell in May and go away, buy again on Leger’s day” goes back to when London stock brokers took the summer off to launch their daughters into high society and enjoy the sporting season of Ascot, Cowes, Henley and so forth, ending with the St Leger flat race during the second weekend in September. With professional investors away racing and shooting over the summer, their return in October to April came to be seen as the serious months for investing, when markets would rise strongly. Today, many senior Wall Street partners spend their summers in the “the Hamptons” leaving junior partners to man the helm during the summer, again returning in the fall. While only antidotal, this is considered one of the causes of the summer lull in the stock markets. The smaller cap stocks have slightly larger seasonal tendencies than larger cap stocks so we will compare a few variations of “Sell in May” as it applies to the small and mid-cap US stocks. We choose the Dow Jones U.S. 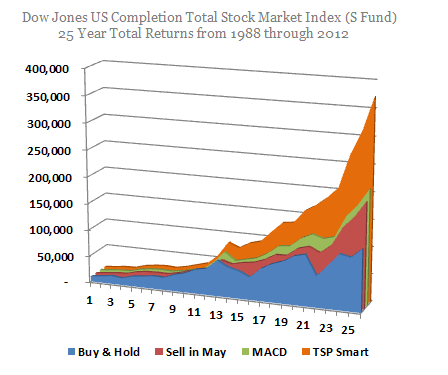 Completion Total Market Index, or in simpler terms the total US stock market minus the S&P 500 index. This index can be held via Vanguard’s VXF ETF and the Thrift Savings Plan S Fund among other funds. In the charts and tables you will find four strategies applied to this index starting with Buy & Hold strategy starting in the fall of 1987 AFTER the stock market crash. The second strategy is the basic “Sell-in-May” strategy that trades at the turn of the month in May and November. The third strategy applies a market trend indicator (MACD) that uses default variables but provides a timing signal only after our optimized seasonal window opens in the spring and fall. And finally, we highlight what a more precise, but still objective seasonal strategy (TSP Smart) can accomplish using both an optimized timing window and optimized MACD variables as it is supposed to be used. Our three seasonal strategies sit half the year out in the safety of a low-risk investment. For our calculations we used the Governments Thrift Savings Plan G fund, but a close equivalent would be T-bills. We also assume investors are using low transaction cost-tax deferred accounts that are readily available today. The four strategies show the progression of performance from a Buy & Hold Investor to an optimized Seasonally Modified Buy & Hold Strategy using the index (TSP S Fund & G Fund). A significant jump is seen when applying the simple Sell in May strategy. If we change from a set calendar date to an investment window with a trend deviation indicator using the default setting on most charting software marginally increased returns over Sell-in-May. Setting optimized seasonal windows with an trend deviation indicator optimized for the index (that includes a delay from signal generation to execution for mutual funds and TSP) resulted in a significant increase in available retirement funds over Sell-in-May, but blows away the Buy & Hold investor. Not to be accused of cherry picking my dates, the table and chart on this page delayed investments until the end of 1987 eliminating significant losses on a buy and hold investor from the effects of the 87’ crash on the data. But missing the 1987 market crash is what this strategy is designed to do. We find most of the drawdowns in bear markets also occur during the weak season in equities while a seasonal investor is sleeping well with his low risk interest bearing investment. Take a look at how our optimized S model performed. 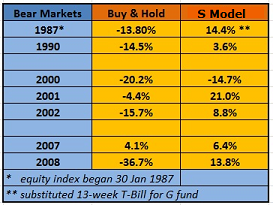 The twelve years after the 1987 crash (1988 until 2000) were part of one of the greatest bull runs in history. The simple strategy presented was not designed to “beat” the market each year, unless you consider risk-adjusted performance, but it did keep up and then significantly advance during large corrections or bear markets. In other words, it significantly beat the buy and hold if your investment horizon includes a full bull and bear market cycle such as seen in the 5 year returns from the beginning of 2008 until the end of 2012, or 15 year return which includes two bull markets and two bear markets. It is worth repeating, the market often goes up during the unfavorable season (weak season). The loss of this gain is partially offset by interest on our low risk investment. The objective is not to try to pick the bottom of the market during the summer lull, but to wait out the historically weak season and re-enter once the favorable season commences. It is during the deep bear market drawdowns the seasonal strategy preserves your capital and your nerves, setting you up for a much better retirement. What guarantees are there that futures returns will equal past returns? Actually, I can guarantee that the results will be different going forward, simply because market returns have never repeated for even buy and hold investors. I can guarantee there will be bear markets, bull markets and bubble markets in the future. Seasonal tendencies do change when the drivers of them change, such as tax code changes, but the summer lull has been observed for over two hundred years and in multiple nation's stock markets. My opinion is the unfavorable season will remain and smart investors will adjust their allocation levels to benefit from them. The question always arises why don't we hear about this strategy more often from our brokerages or the financial media. My only guess is that has something to do with the fact that much of the financial industry derives income (fees and expenses) when you are trading or invested. 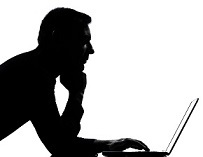 To lose expense fees for half the year would be a big pay cut for the industry. I also see many articles appear in the spring denying the pattern exists and then the same sources write in October about how we are entering the favorable period for equities. Which is it? You have my answer. The bottom-line is adding a seasonal filter to your allocations increases your returns over the full-market cycle (bull/bear market) by decreasing your exposure to risk and not by increasing risk. The best part is that it is simple to execute. You can also take a look at our Bellwether Timing Results as it is applied to several index funds to include the SP500, the DOW, and the total US stock market. I've added some tables on the markets returns while sitting out of stocks. If you are new to this website, welcome. Please look around to include our Levels of Service page that includes a very low cost timing service that pays for itself and provides a good reminder each year. We also have *trading day* almanacs (log in required) for the index used here, the S&P 500 and others as well as investing reports focused on indications related to bear markets and large market corrections.